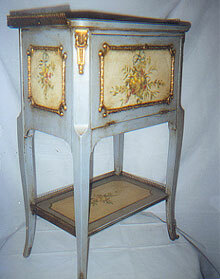 French Circa 1900 - This piece was disassembled, repainted and the metal mounts were re-gilded. The panels and delicate scale of the cabinet gave an opportunity to paint decoratively in the style of porcelain panel Sévres furniture. The tilted basket filled with flowers and fruit held by a blue silk ribbon conveys the lighthearted charm of the eighteenth century.